Are you having the same day over and over again? After five frustrating years trapped in my own relationship and career rut, I discovered the reason why many people keep themselves stuck, and struggle to find a way to move forward. Stuck in a Rut – How to Rescue Yourself and Live your Truth is a 234 page motivational/self-help book in which I reveal my successful “get unstuck” method, and how it has helped my clients finally get out of their health, relationship, career and life ruts to confidently take the first steps towards creating the life they want to live. My practical 12-step method blends popular psychology, success strategies, and practical tips, making the process so simple and easy to follow. 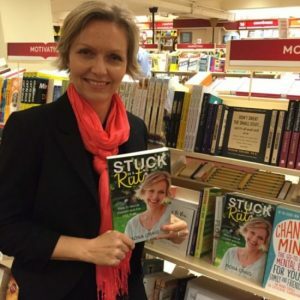 In Stuck in a Rut – How to Rescue Yourself and Live your Truth you will learn the simple 12-step “Get Unstuck” method to help you bust through barriers quickly and easily. – Know the reason why you’re stuck so you can instantly make the changes you need and move forward. – How to break those bad habits and ditch the guilt, stress and worry, so you’re always inspired, motivated and able to take action. – How to let go of the fear of failure and negative self talk, so you can live with confidence and take educated risks. – How to love yourself and make self-care a priority. – How to set better boundaries and say “no” with confidence. – How to tap into your creative spirit to find joy. – How to create a life-vision and action plan that keeps you motivated and living life to your full potential. Each chapter contains case studies of real clients who have implemented my technique and triumphed. By consistently following the steps and taking action, you too can bust through the barriers that keep you stuck, and unlock your true potential. PLUS postage within Australia (Allow 3-5 working days). PLUS a 30 minute Skype/telephone coaching session (valid for 3 months from the time of purchase). TOTAL VALUE is $165 for the all inclusive price of $27. To purchase simply CLICK HERE. Or make an appointment to talk to Fiona Craig on 0405 433 217 to learn more about how my life coaching & business mentoring can help you.